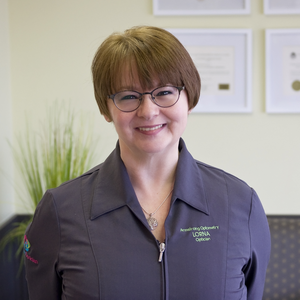 Lorna is an Optician who joined out team in 2014, with years of experience in the optical industry in the Lower Mainland. She brings her expertise to frame and lens selections, helping you look and see your best! She also does an excellent job of maintaining our ever-changing inventory of ophthalmic frames and sunglasses. She is enjoying her new life as an Armstrong resident and enjoys hammocks and label-makers.